Here are four stages of my process for painting architecture, focusing on the central section of Sharamoor, a tranquil island in the heart of the city of Chandara. First, here’s the color study, painted in oil. What you see is about three by five inches. I like to see how far I can take an idea without any reference whatsoever, because compositional ideas have a certain unity if they’re guided purely by the imagination. Next I built a quick architectural maquette from painted styrofoam. It's sitting on a mirror to simulate the reflections on still water. I talked about these reference models on a September 15 post. Based on photos of the maquette and on photos of architecture from India and Thailand, I drew the perspective line drawing. This step alone took about a week. Notice the lines in the sky that gently slope down to the right. These are called a ‘perspective grid’ and they serve as guidelines when the vanishing point is too far away to reach with a yardstick. By establishing these evenly spaced lines across the whole picture, I can find the slopes of any other lines between them. There’s still room to improvise on the final oil painting. Notice how the shape of the main dome has changed. My interest now is primarily in light and color. The photo scrap and plein air studies helped establish how the early morning light would look on a gold dome. From sketch to finish this painting took about four months. The painting is on canvas mounted to a birch plywood panel, 24 by 52 inches. Obviously I couldn’t lavish quite this much time and effort on every single piece of art for Journey to Chandara. At four months per painting, the 150 images needed would take about 50 years to complete! My readers are a patient lot, but there are limits. I just finished reading "Journey to Chandara" yesterday. An excellant book by all means. Pity that that you can't put 3 months into each painting, but then as you mentioned that would take years. Perhaps you will be able to sketch thousands of rough drawings that some descendant of yours will be able to finalize. 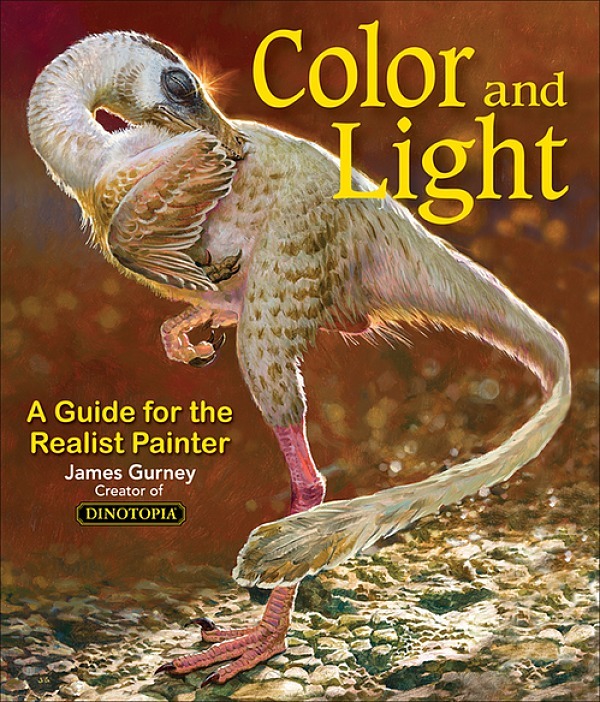 But of course, there's only one James Gurney. Don't worry that not all of your paintings are up to the level you want them. 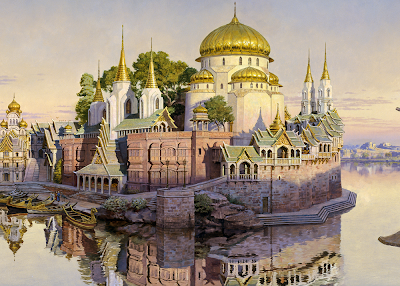 I think more people are interested in seeing the different realms of Dinotopia explored and expanded. Personally, I would love to see a painting of Crabb feeding "monks" at the monestary. Maybe with the sun rising on the ocean behind them while Crabb holds his breath. It's amazing to see this process. I love to see other peoples art processes, you can absorb the lessons while maintaining your own personal methods. I always wanted to build maquettes but I dont feel confident in my sculpting abilities. I think your initial imaginative sketch is great, it makes sense to me that the initial idea begins this way, your architextural paintings look so original and they look real. Like a place I could visit. So, what happens to all the maquettes? 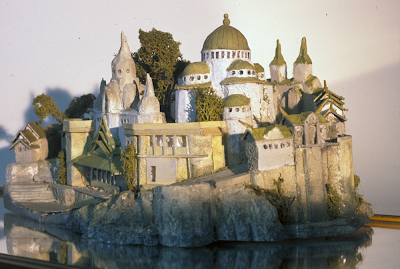 Is your backyard an amazing miniature city? 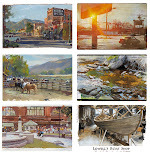 It's an inspiration to see your work and to see classically educated drawing and painting. This blog is quickly becoming a daily staple. Tons of great information. I love the process. I like getting a peek into your brain. And now, thanks the Eric's comment, I picture your backyard filled with little buildings and cities. Gurneyland. Gurneyland! How much for a ticket? This is an amazing painting. Like a magnet, it pushed my hand to the Amazon's "Buy now!" button! Keep up with your fantastic worlds! My eyes will continue to orbit around your planets! Thanks to all of you for your incredibly kind comments. I wish I could respond properly to all of them, but things have gotten incredibly hectic all of a sudden, and I only am doing internet at libraries, Starbucks, and other hobo locations. But please know I read and appreciate all your thoughts. 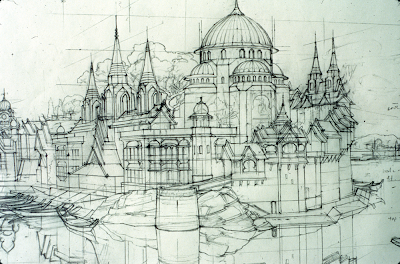 As soon as I saw your pencil sketch of the central section of Sharamoor, I thought about my perspective class at The Art Center College of Design in Los Angeles. I had Ted Youngkin for perspective. I wonder if you had him too. I encounter perspective situations often in my story blog, The Trowbridge Chronicles, but I'm able to eyeball in most situations, because I can't spend too much time on the art for the blog.I wish I could. I've admired you work over the years, and I'm glad that you've joined the ranks of the bloggers. I hope you can keep up the frequent posts. I've managed to keep mine quite regular for over 1 1/2 years but it's been a real sacrifice. Almost no free time. I'll keep checking back. I've really enjoyed your blog, with the variety of academic insights that you present. Amazing how the final painting has so much more detail than the maquette. I still wonder how you did the boats.